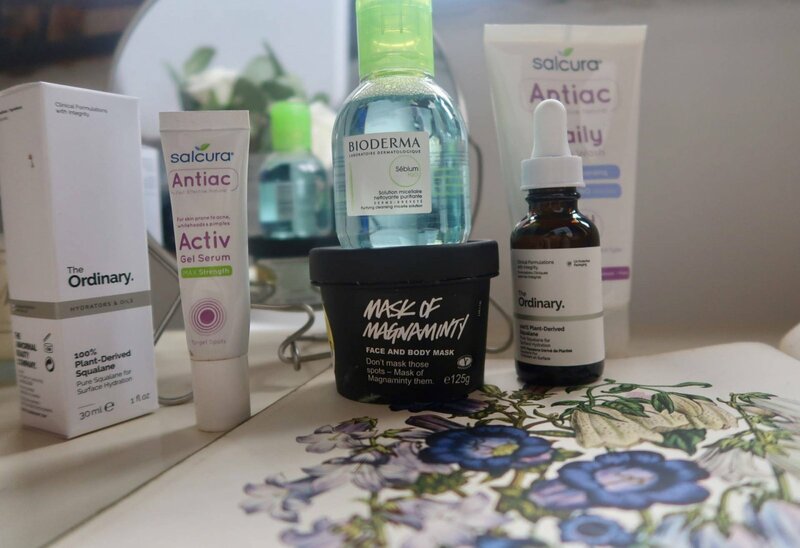 In my last skincare post I shared my struggle with acne over the past 15 years or so. You can read more about that here including some of the medications I’ve tried and how they did or didn’t work for me. I was a bit nervous to start talking about all of this to be honest as I tend to swing between trying really hard with new products and treatments and burying my head in the sand and applying more makeup! Thankfully the reception to my post was really positive with lots of you sharing similar stories, particularly on Facebook. I promised I’d share some of the products that have made a real difference for me in the past few months so here we are. As ever I won’t reccomend anything I haven’t tried or give a false representation of how effective something is. With that said everyones skin, genetic makeup and hormone balance is different. If I do reccomend something that turns out not to suit you, I really am sorry. I know too well how demoralising it can be to hear someone praising a product only for it to not have any impact on your skin. I’ve been there, many times. 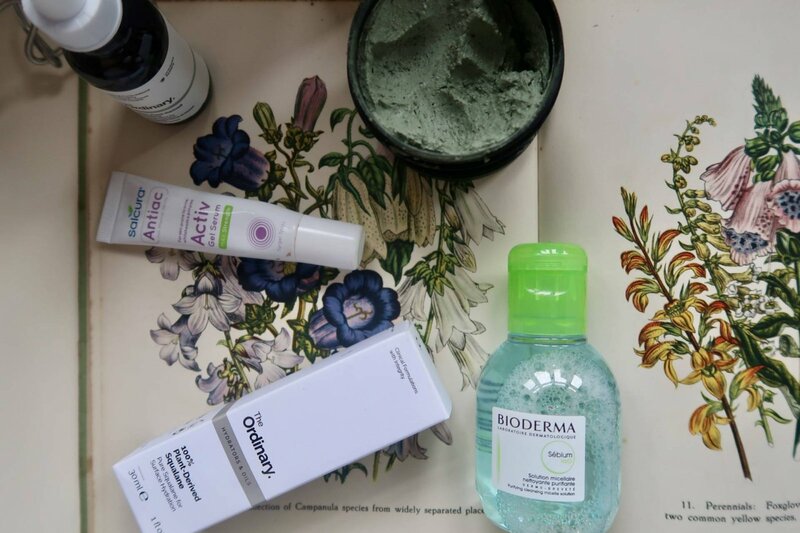 The cornerstone product in my skincare routine is a makeup removing micellar water from the Sebium range at Bioderma. Sébium H2O is the 1st specific make-up removing micellar water for combination or oily skin. It’s really gentle and non drying so doesn’t send my naturally oily t-zone into overdrive! After using it I feel clean and fresh right away, I love the fact that I don’t have to rinse my face afterwards and that there’s no parabens. It’s also non comedogenic which means that it doesn’t block pores and promote instances of comedoes – those are blackheads to you and me. I use this product at least once a day but generally twice. Following the Sébium H2O I use the super gentle Antiac Daily Wash from Salcura. It’s a ph neutral face wash which is 98% natural and soap free. I consider this to be the perfect face wash for anyone with problem skin because it is so gentle yet offers such a deep cleaning sensation. I don’t know about you but when I was younger I always sought out the harshest, most intense treatments and used them in tandem. I wanted to force my skin to be clean and clear but I was punishing it and making it more sensitive by using all these rough scrubs and drying products. The Antiac Daily Wash is really incredible, to the point that they offer a money back guarantee. 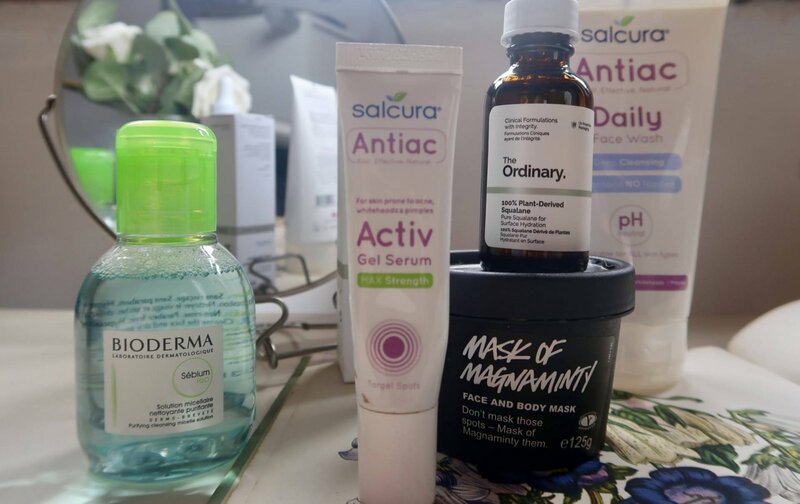 For particularly angry flareups I always reach for a sister product in the Antiac range, ACTIV gel serum is designed to stop individual spots in their tracks. It’s made up for 97% natural ingredients such as rosemary, aloe vera and tea tree. I’ll be totally honest I did not expect this to work on my skin but it really does. It’s not something I use everyday but whenever I have a flareup it’s always there for me and gives quick results. Throughout all my reading and around acne and skincare one of the things I picked up was that I needed to stop stripping moisture away from my skin in attempt to control oil. Instead I need to give my skin the moisture it thinks it needs, to calm that overproduction. I’ve been using plant derived squalene from The Ordinary which I really do like but I find it a bit of a faff to apply. It’s a liquid and comes in a glass bottle so whilst it does look cool it’s not quick and easy to use. I’m looking for a new daily moisturiser that’s as natural as possible. Neal’s Yard is a natural and organic brand with a lot of options for oily skin including some cream based moisturisers so I’m going to try one of those next. If you ever watch my Instagram stories you’ll know I love popping into my local Lush store. Lu and I always have a lot of fun and come away with a few treats. Until recently I’d always stuck with bubble bars for myself and jelly bombs for Luisa but I decided to try their famed Mask of Magnamity. Unfortunately it didn’t agree with me despite it being a holy grail product for so many people. I found it too clumpy and messy for something that didn’t visibly improve my skin, I do love the smell though. I’m quite tempted to try their Cup’o’Coffee scrub next time as I’ve heard it’s very good. After reading a lot of your comments on Facebook and talking to my friend Lauren at Dilan and Me I really want to try something from Paulas Choice and experiment more with direct acids from The Ordinary. As well as my acne concerns I really want to get some anti-aging treatments going on, after all my 30s are approaching! So there you have it, the products I’ve used for over 8 weeks and had success with plus a few I don’t rate. I’d love to talk more about this topic if it’s something you’re interested in so do leave me any questions or pop me a message on social media. I have another post going up next week about occasional treatments I use which aren’t part of my daily skincare rituals.